Virginia Moulton, 93, of Vero Beach, died Monday, September 17, 2018. “During our years, Virginia called upon a variety of chapter members in all three counties to maintain many issues to discuss. She was pleased that this group could be organized. She started to invite public relations people in Fort Pierce, and mainly ladies attending Indian River Community College. Those members, such as Mary Lock, started attending the meetings and eventually signed up for a full member organization. A year or so later, Karen Brown and myself started to review interest in a Stuart FPRA Chapter and that brought all three Chapters together for our area. We are still together!!!!!!!!!! A public relations writer until she retired in 1997, Virginia assisted in the launch of several communities in Vero Beach, including The Moorings, and created special advertising sections in national publications to highlight the best of Florida living. 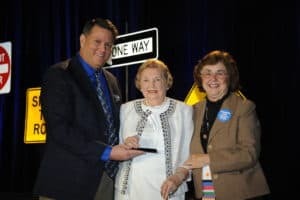 In August 2014, she was awarded “Life Membership” in the Florida Public Relations Association, only the second member to be honored in the organization’s 76-year history. Virginia was a volunteer with the Indian River Medical Center’s Auxiliary and was a charter member of the Indian River Guild of the Hibiscus Children’s Center. She and her husband were charter members of The Moorings Yacht and Country Club, former members of the Vero Beach Yacht Club, and belonged to Christ By the Sea Methodist Church. She is survived by her two sons and their families in Vermont and Vero Beach. In Vermont, her son Richard (Melinda) Moulton Sr. of Huntington resides with grandchildren Richard (Colleen) Moulton III of Vergennes and Mariah (Josh) Riggs of Huntington, and four great-grandchildren: Addison and Taylor Moulton, and Rowan and Phoebe Riggs. In Vero Beach, her son David (Elizabeth) Moulton resides with grandson Nathaniel Moulton. A private ceremony and burial will be held at the family cemetery in Vermont. In lieu of flowers, the family is requesting that donations be made to the Alzheimer & Parkinson Association of Indian River County. Condolences may be shared online at www.coxgiffordseawinds.com.